I've been in search of a good easy jerk chicken recipe and came upon this one in an Everyday Food. It had the right amount of spice and the little bit of sugar was an excellent addition. grill up the zukes with your chicken until done. Make the cous cous then throw in the zukes, 1/4 to 1/2 cup parsley and 2 T red wine vinegar. delish. 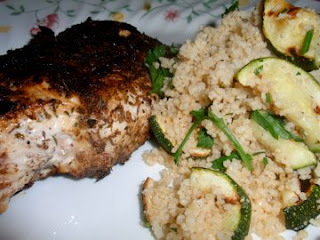 I wish I could come over for dinner this week... :( The zukes look amazing and bring on the jerk chix. Miss you mucho.